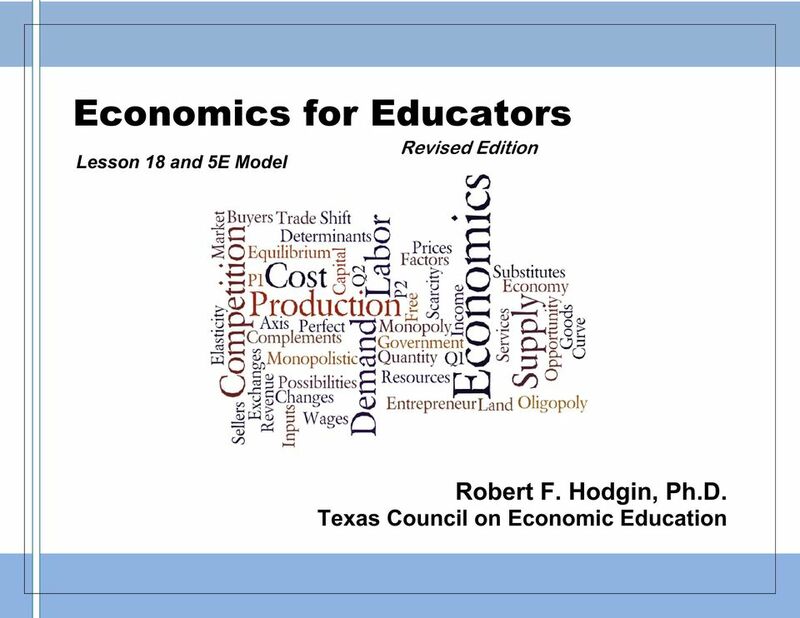 1 Economics for Educators Lesson 18 and 5E Model Revised Edition Robert F. Hodgin, Ph.D.
4 100 Economics for Educators, Revised a good in the home country compared to a potential trading partner s opportunity cost to see who should specialize and trade which good(s) to the benefit of both countries. Comparative Advantage -One person or country should specialize in producing those good(s) where they have the lower opportunity cost compared to another person or country producing the same good. 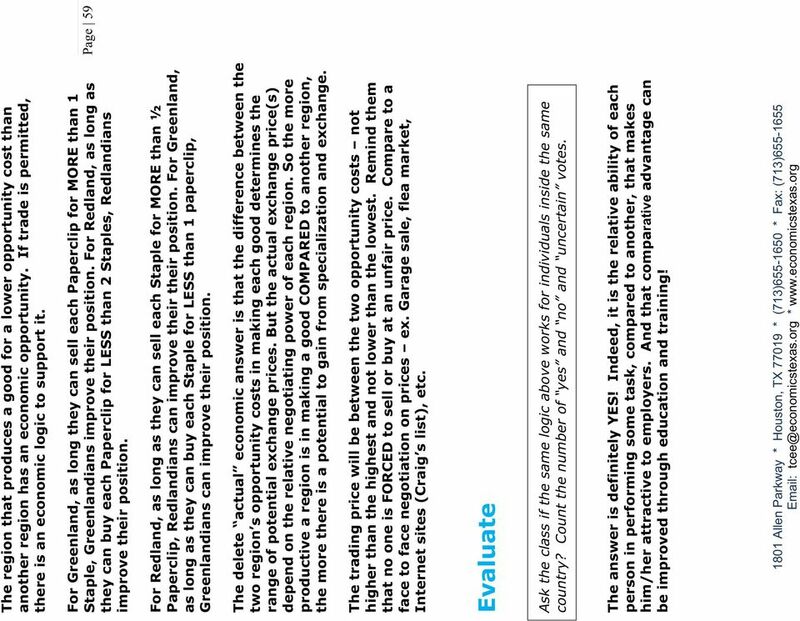 To see how this law operates, inspect the data in the table below where Sidney and Francis as workers in two separate countries produce either fruit or sugar. For Sidney, one day s effort produces one unit of fruit; but she could have made two units of sugar. So, making 1 unit of fruit costs Sidney 2 foregone sugar units. For Francis, one day s effort can produce 3 units of fruit or 4 units of sugar, not both. So, 1 fruit unit (3/3 = 1) costs Frances 4/3 sugar units. 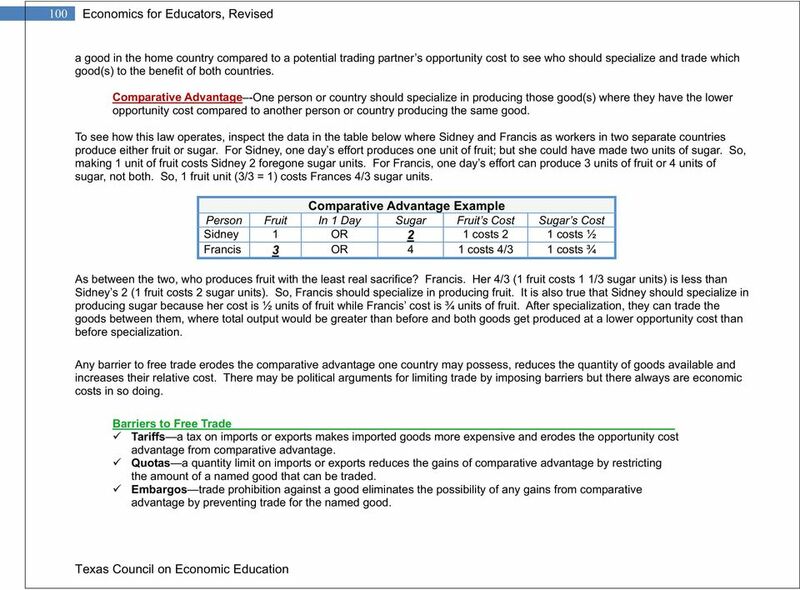 Comparative Advantage Example Person Fruit In 1 Day Sugar Fruit s Cost Sugar s Cost Sidney 1 OR 2 1 costs 2 1 costs ½ Francis 3 OR 4 1 costs 4/3 1 costs ¾ As between the two, who produces fruit with the least real sacrifice? Francis. 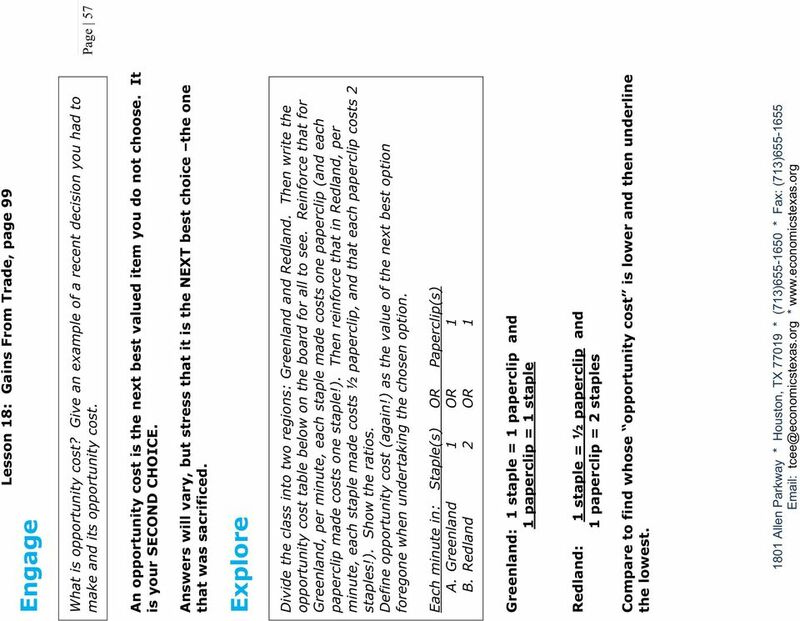 Her 4/3 (1 fruit costs 1 1/3 sugar units) is less than Sidney s 2 (1 fruit costs 2 sugar units). So, Francis should specialize in producing fruit. It is also true that Sidney should specialize in producing sugar because her cost is ½ units of fruit while Francis cost is ¾ units of fruit. After specialization, they can trade the goods between them, where total output would be greater than before and both goods get produced at a lower opportunity cost than before specialization. Any barrier to free trade erodes the comparative advantage one country may possess, reduces the quantity of goods available and increases their relative cost. There may be political arguments for limiting trade by imposing barriers but there always are economic costs in so doing. Barriers to Free Trade Tariffs a tax on imports or exports makes imported goods more expensive and erodes the opportunity cost advantage from comparative advantage. Quotas a quantity limit on imports or exports reduces the gains of comparative advantage by restricting the amount of a named good that can be traded. Embargos trade prohibition against a good eliminates the possibility of any gains from comparative advantage by preventing trade for the named good. 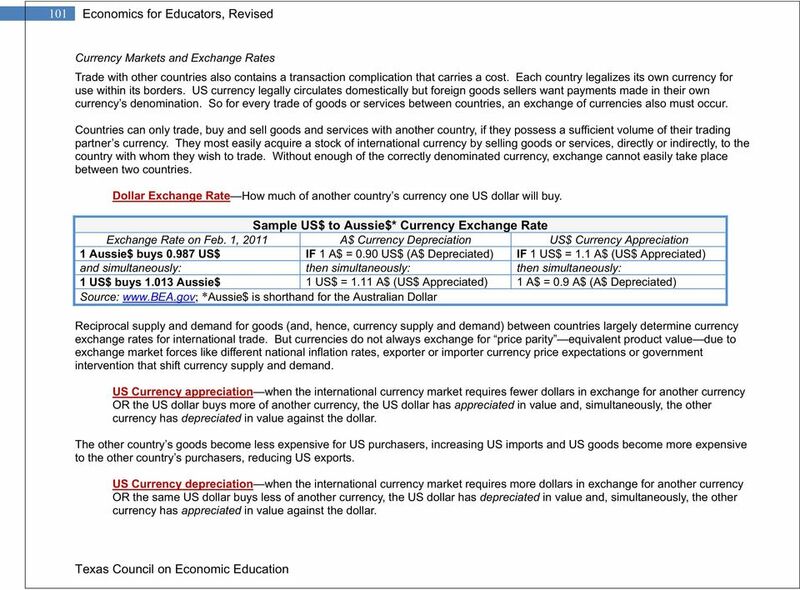 5 101 Economics for Educators, Revised Currency Markets and Exchange Rates Trade with other countries also contains a transaction complication that carries a cost. Each country legalizes its own currency for use within its borders. US currency legally circulates domestically but foreign goods sellers want payments made in their own currency s denomination. So for every trade of goods or services between countries, an exchange of currencies also must occur. Countries can only trade, buy and sell goods and services with another country, if they possess a sufficient volume of their trading partner s currency. They most easily acquire a stock of international currency by selling goods or services, directly or indirectly, to the country with whom they wish to trade. Without enough of the correctly denominated currency, exchange cannot easily take place between two countries. Dollar Exchange Rate How much of another country s currency one US dollar will buy. Sample US$ to Aussie$* Currency Exchange Rate Exchange Rate on Feb. 1, 2011 A$ Currency Depreciation US$ Currency Appreciation 1 Aussie$ buys US$ IF 1 A$ = 0.90 US$ (A$ Depreciated) IF 1 US$ = 1.1 A$ (US$ Appreciated) and simultaneously: then simultaneously: then simultaneously: 1 US$ buys Aussie$ 1 US$ = 1.11 A$ (US$ Appreciated) 1 A$ = 0.9 A$ (A$ Depreciated) Source: *Aussie$ is shorthand for the Australian Dollar Reciprocal supply and demand for goods (and, hence, currency supply and demand) between countries largely determine currency exchange rates for international trade. But currencies do not always exchange for price parity equivalent product value due to exchange market forces like different national inflation rates, exporter or importer currency price expectations or government intervention that shift currency supply and demand. US Currency appreciation when the international currency market requires fewer dollars in exchange for another currency OR the US dollar buys more of another currency, the US dollar has appreciated in value and, simultaneously, the other currency has depreciated in value against the dollar. The other country s goods become less expensive for US purchasers, increasing US imports and US goods become more expensive to the other country s purchasers, reducing US exports. US Currency depreciation when the international currency market requires more dollars in exchange for another currency OR the same US dollar buys less of another currency, the US dollar has depreciated in value and, simultaneously, the other currency has appreciated in value against the dollar. 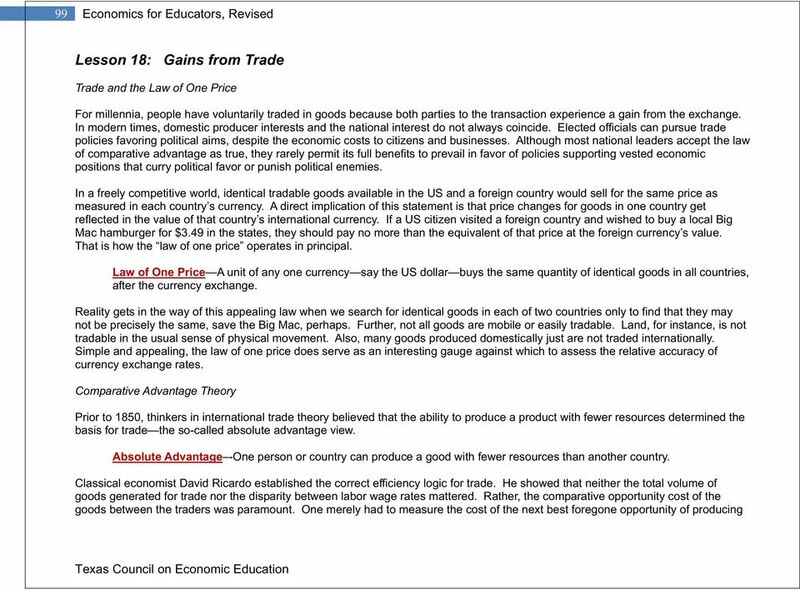 6 102 Economics for Educators, Revised The other country s goods become more expensive for US purchasers, decreasing US imports and US goods become less expensive to the other country s purchasers, increasing US exports. Currency exchange rates between trading countries fluctuate based on the demand for and supply of a country s international currency for trading purposes. For example, if the US demand to purchase more goods from Germany increases, then more international dollars must be exchanged for German marks to facilitate the transaction. 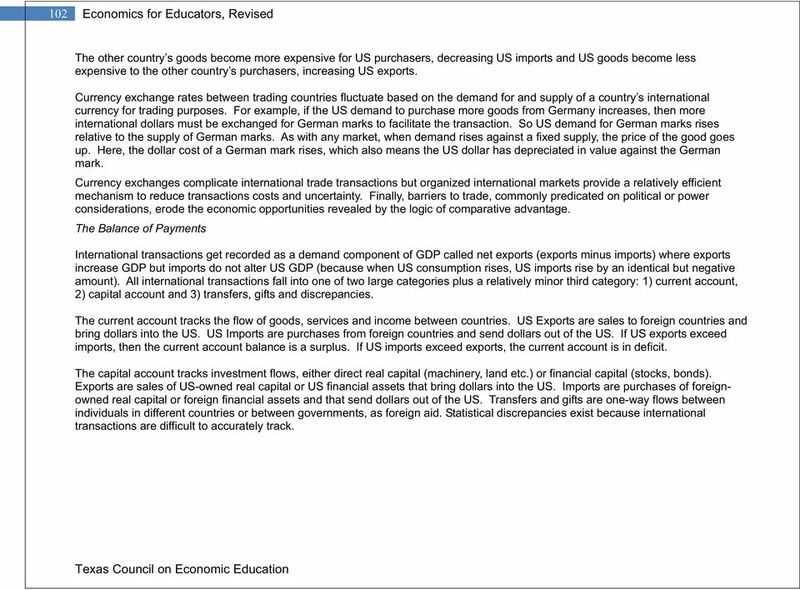 So US demand for German marks rises relative to the supply of German marks. As with any market, when demand rises against a fixed supply, the price of the good goes up. Here, the dollar cost of a German mark rises, which also means the US dollar has depreciated in value against the German mark. Currency exchanges complicate international trade transactions but organized international markets provide a relatively efficient mechanism to reduce transactions costs and uncertainty. Finally, barriers to trade, commonly predicated on political or power considerations, erode the economic opportunities revealed by the logic of comparative advantage. The Balance of Payments International transactions get recorded as a demand component of GDP called net exports (exports minus imports) where exports increase GDP but imports do not alter US GDP (because when US consumption rises, US imports rise by an identical but negative amount). All international transactions fall into one of two large categories plus a relatively minor third category: 1) current account, 2) capital account and 3) transfers, gifts and discrepancies. The current account tracks the flow of goods, services and income between countries. US Exports are sales to foreign countries and bring dollars into the US. US Imports are purchases from foreign countries and send dollars out of the US. 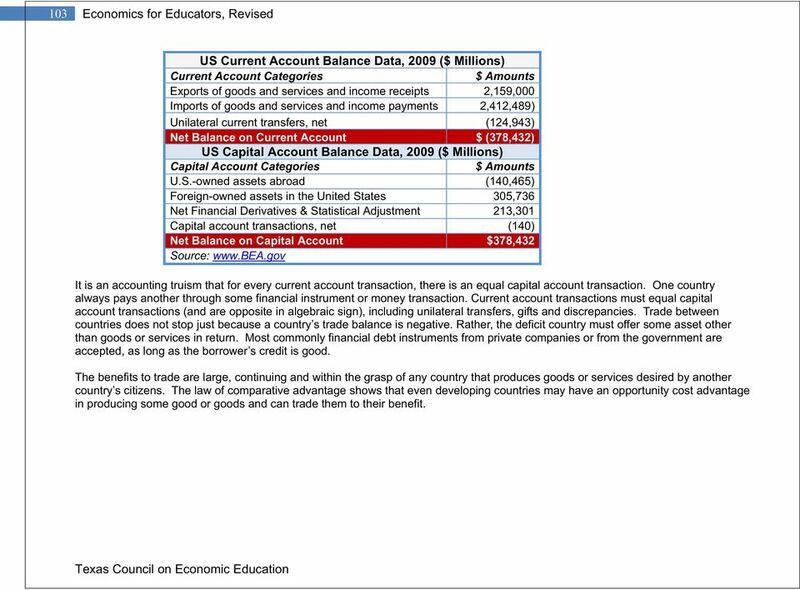 If US exports exceed imports, then the current account balance is a surplus. If US imports exceed exports, the current account is in deficit. The capital account tracks investment flows, either direct real capital (machinery, land etc.) or financial capital (stocks, bonds). Exports are sales of US-owned real capital or US financial assets that bring dollars into the US. 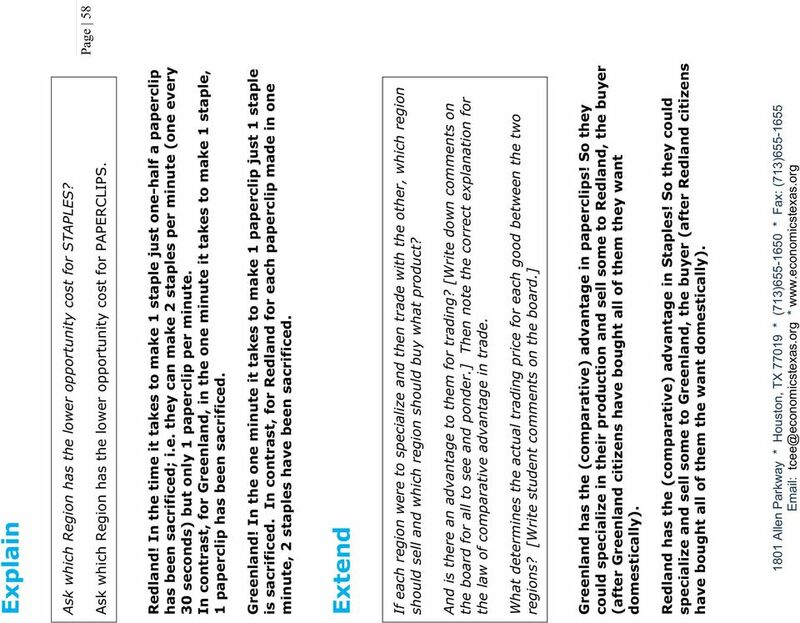 Imports are purchases of foreignowned real capital or foreign financial assets and that send dollars out of the US. Transfers and gifts are one-way flows between individuals in different countries or between governments, as foreign aid. Statistical discrepancies exist because international transactions are difficult to accurately track. 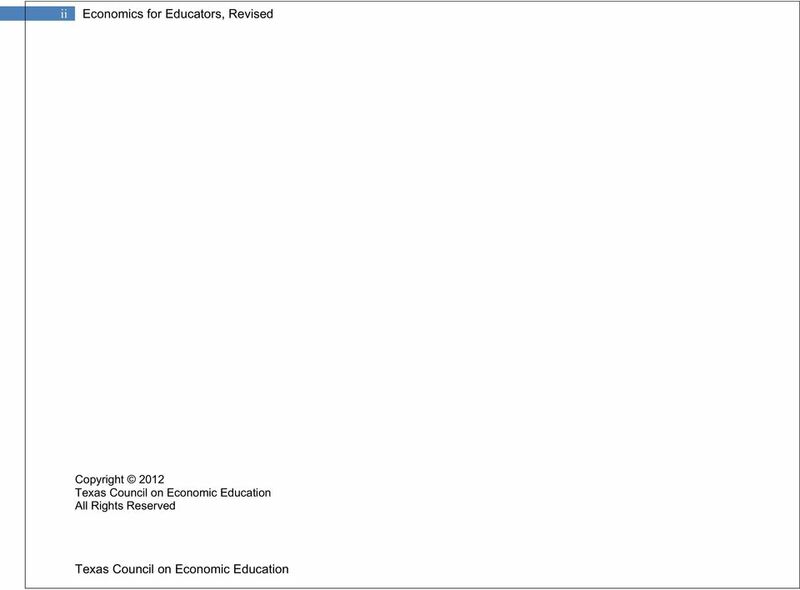 7 103 Economics for Educators, Revised US Current Account Balance Data, 2009 ($ Millions) Current Account Categories $ Amounts Exports of goods and services and income receipts 2,159,000 Imports of goods and services and income payments 2,412,489) Unilateral current transfers, net (124,943) Net Balance on Current Account $ (378,432) US Capital Account Balance Data, 2009 ($ Millions) Capital Account Categories $ Amounts U.S.-owned assets abroad (140,465) Foreign-owned assets in the United States 305,736 Net Financial Derivatives & Statistical Adjustment 213,301 Capital account transactions, net (140) Net Balance on Capital Account $378,432 Source: It is an accounting truism that for every current account transaction, there is an equal capital account transaction. One country always pays another through some financial instrument or money transaction. Current account transactions must equal capital account transactions (and are opposite in algebraic sign), including unilateral transfers, gifts and discrepancies. Trade between countries does not stop just because a country s trade balance is negative. Rather, the deficit country must offer some asset other than goods or services in return. Most commonly financial debt instruments from private companies or from the government are accepted, as long as the borrower s credit is good. The benefits to trade are large, continuing and within the grasp of any country that produces goods or services desired by another country s citizens. The law of comparative advantage shows that even developing countries may have an opportunity cost advantage in producing some good or goods and can trade them to their benefit. 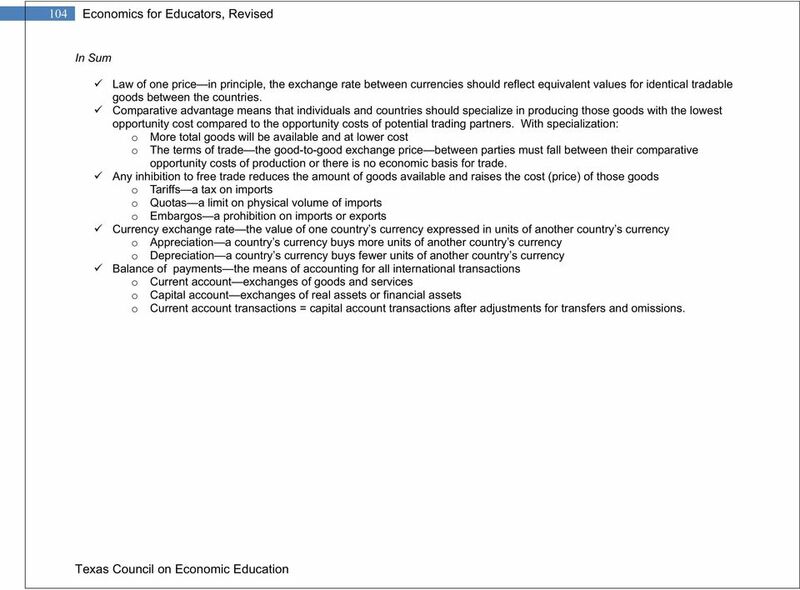 8 104 Economics for Educators, Revised In Sum Law of one price in principle, the exchange rate between currencies should reflect equivalent values for identical tradable goods between the countries. Comparative advantage means that individuals and countries should specialize in producing those goods with the lowest opportunity cost compared to the opportunity costs of potential trading partners. With specialization: o More total goods will be available and at lower cost o The terms of trade the good-to-good exchange price between parties must fall between their comparative opportunity costs of production or there is no economic basis for trade. Any inhibition to free trade reduces the amount of goods available and raises the cost (price) of those goods o Tariffs a tax on imports o Quotas a limit on physical volume of imports o Embargos a prohibition on imports or exports Currency exchange rate the value of one country s currency expressed in units of another country s currency o Appreciation a country s currency buys more units of another country s currency o Depreciation a country s currency buys fewer units of another country s currency Balance of payments the means of accounting for all international transactions o Current account exchanges of goods and services o Capital account exchanges of real assets or financial assets o Current account transactions = capital account transactions after adjustments for transfers and omissions. 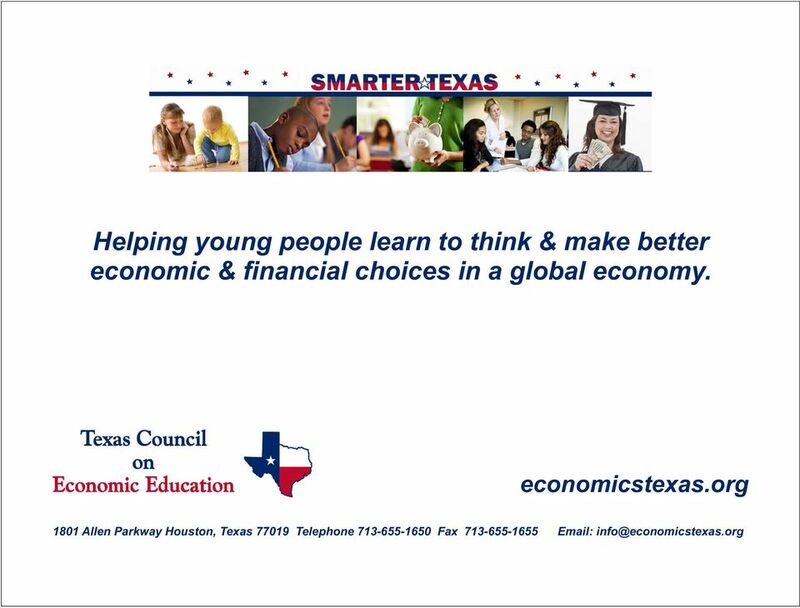 12 The (TCEE) thanks the Council for Economic Education and the Department of Education Office of Innovation and Improvement for awarding the Replication of Best Practices Program grant that allowed Economics for Educators, Revised Edition to be written and published. 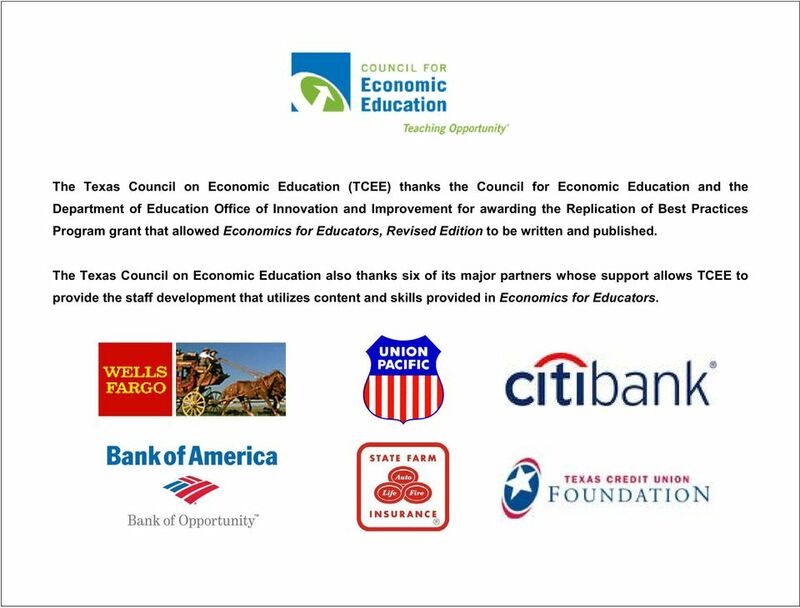 The also thanks six of its major partners whose support allows TCEE to provide the staff development that utilizes content and skills provided in Economics for Educators.